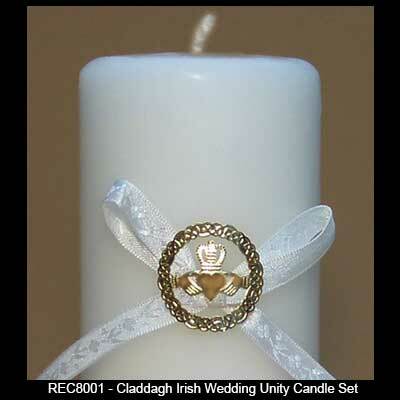 This Claddagh unity candle features a gold finish and it would be ideal for your Irish wedding. The Claddagh pillar candle measure 8" tall. 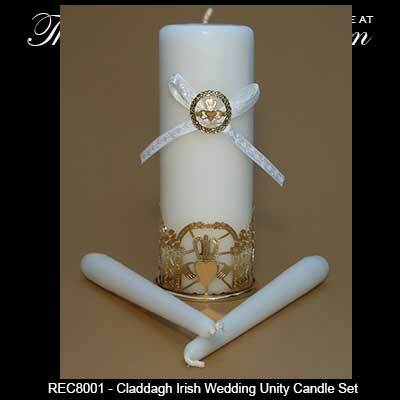 This Irish unity candle holder and the included pillar candle both feature the Claddagh. 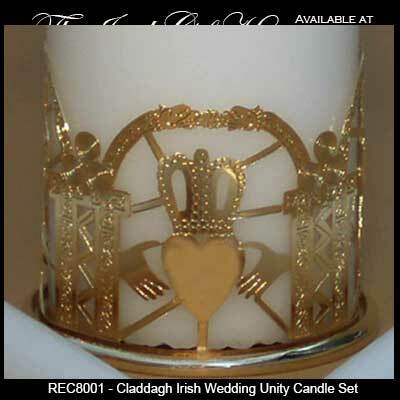 The Claddagh candle holder is made of embossed gold plated metal. The white pillar candle features a gold plated emblem that is enhanced with the Claddagh surrounded by filigree knot-work. Two white tapper candles are also included in the set. The gold Irish candle holder is made in the United States and is gift boxed with Claddagh and Celtic knot history cards that are complements of The Irish Gift House.